Update 5/27/14: Please see the Connecticut Mirror for a new op-ed by DataHaven Urban Fellow Deanna Song, "Connecting More People to Work in Greater New Haven," which explores job access scenarios in greater detail. Original article, 4/24/14: From the New Haven Green, you can walk to about 90,000 jobs within an hour commute. From the Milford Green, you can walk to about 16,000. From the Branford Green? About 3,000. That's according to a new "Jobs Access map" released yesterday by our colleagues at the Regional Plan Association (RPA). The interactive tool also allows you to look at where you can get to by car, public transportation, or bike, not to mention filter by travel time, desired industry, and worker education level. The new maps are based on complex data sets that were not available - i.e., not collected nationally - until relatively recently, the fruits of multi-year efforts by the Census Bureau and other agencies. You may find yourself disagreeing with a particular visualization, as the interactive map is based on the application of a somewhat uniform formula across the entire New York metropolitan area that makes assumptions about travel speeds, geography, and many other inputs. The outputs are based on a model, so like survey-based data, are not 100% precise. The issue of metropolitan opportunity, which is highlighted in these maps, has an enormous impact on our economy, housing, well-being, and ability to be a sustainable and resilient city. Looking at the map, it is easy to see the importance of our transportation infrastructure and land use, and how it relates to issues of affordability (transportation is generally the second-largest household expense, after housing). In New Haven, the issue is particularly important, with New Haven Mayor Toni Harp emphasizing repeatedly that transportation is a civil rights issue. The largest-ever survey of our region, the DataHaven Community Wellbeing Survey, found that many families with children earning less than $50,000 per year did not have regular access to a car, while virtually all of those earning more than $50,000 per year did. Residents who rely on transit were much more likely to feel that the job market is poor. 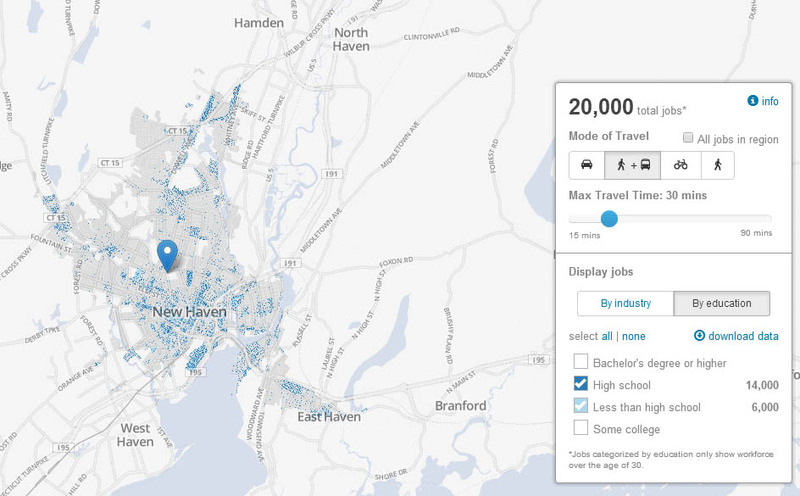 Greater New Haven Jobs Access and Transit Study Using the same data sets as those used in the RPA's map, DataHaven is involved in a small study that involves mapping transit and job patterns for the entire Greater New Haven region. Building upon the RPA's aggregate map, we are able to also drill down into data by job shift (time of commute), neighborhood type, worker race/ethnicity, worker age, job earnings level, and other characteristics. This deeper local analysis can reveal interesting patterns around disparities in access to "living wage" jobs. Here's one data point that stood out to us in our earlier work on this issue: There are 4,000 African-American and Hispanic workers earning less than $40,000/year who live in New Haven's "Outer Ring suburbs," a collection of 10 towns that surround our core municipalities of New Haven, East Haven, Hamden, and West Haven - that represents 4% of the total number of workers who live in those towns. At the same time, there are 16,000 African-American and Hispanic workers earning less than $40,000/year who hold jobs in those towns - that's 15% of the total employment base in those towns. As we showed in our Community Index, high-income workers living in our suburbs rely on New Haven for the majority of their high-paying jobs, but they also rely in large part on a substantially less well-paid, diverse workforce that commutes in from places like New Haven. If everyone had access to high-quality transportation whether or not they owned a vehicle, more of these suburban jobs - many of which fall within second shifts at retail centers - might be accessible to city residents. Results from the initial study should be ready later in the year. In the meantime, follow RPA as they enhance their map and other data tools as part of their Fourth Regional Plan. As this is a new field, please contact DataHaven if you have suggestions on what issues are most interest to local legislators or organizations who are working on expanding economic opportunity, either at a neighborhood or a regional or statewide level.